The first is the fantasy warrioress. Her weapon at the ready and a stern expression on her face tell you that she means business. The clothing and building whisper secrets of a strange world where life is cheap and anything can happen. 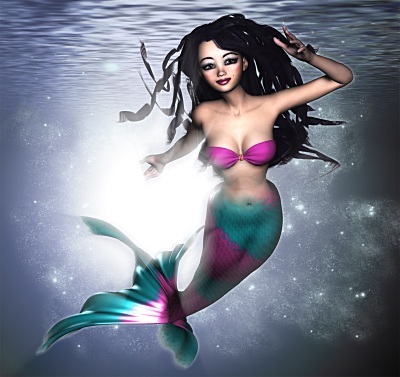 Mystical mermaid pictures always hint at more than they say. 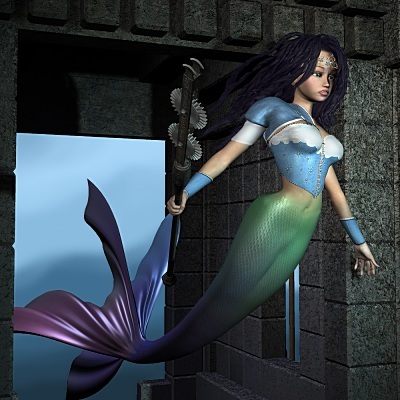 The mermaid beckons us to enter the light, perhaps it is the door to new world or to mystical knowledge. To me, simple black and white is never simple. This picture took more time than the other two combined. It is more abstract as well. It was inspired by another artist named Anna Bird. You can see a couple of her pictures on my sirens page.